It's here! 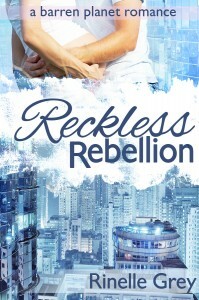 Reckless Rebellion is available on Amazon today. With Tyris's home planet in sight, Marlee is looking forward to exploring her new home. Only a routine medical exam to go, then they can be together on the thriving planet of Urslat. Incredibly, the exam reveals something that shouldn't be possible. Something that is actually illegal because of Tyris’s past. Marlee’s pregnant. Marlee and Tyris will do everything they can to keep their secret safe. But Urslat has its own problems, forcing Marlee to choose between everyone she has ever known and the ultimate secret she carries within. To celebrate, Reckless Rescue is free for three days, so grab your copy now! Thanks Nana. Hope your new book is going well too. A huge congrats on your release. Your cover is very intriguing. Also classy. I like it a lot! Thanks Victoria. I love it too. I’m lucky that my sister is a graphic designer, and helps make all my covers.